Want an alternative to the traditional Easter basket? Or just want send a gift to celebrate the Spring thaw? Cooke Tavern Soups are a delicious, healthy way to celebrate the season of renewed growth. 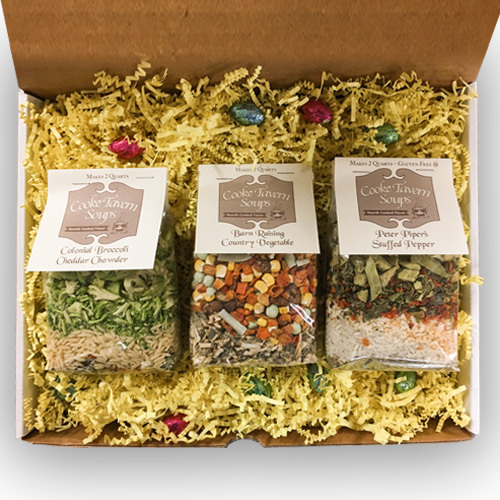 Order one to send across the country or hand deliver on your next visit, complete with a few bite-sized Hershey’s chocolate eggs. These boxes are packaged with spring in mind. Packed in a white box, you have the choice of three pastel colors of filler material (crinkle paper) – yellow, pink or blue. Your personalized message will be hand written and placed inside the box. Note: An order can only be delivered to a single address. If you’re purchasing items for yourself as well as to send to someone else, please place each order separately.